In the second half of the 1970's Peter Schild got interested in building a pedal steel guitar, and he began by making lever and force measurements on his workbench which eventually culminated in his first pedal steel. The 80's saw a number of prototypes featuring subsequent improvements, and by the end of the decade he was ready to produce and sell his guitars. At about the same time, Paul Wiesner opened the first and only steel guitar store in Switzerland, and Peter was going to build steel guitars for him to sell. However, at some point in time, Paul and Peter had continuing arguments about some aspects of the guitar design which they couldn't settle. This resulted in the termination of their business relationship. Subsequently, and together with a friend who was a mechanic, Paul Wiesner took a Schild guitar apart, making notes of the dimensions of every single part, and started to build copies of the Schild to sell them under his own name. Unfortunately, at that time, Peter was not knowledgeable in legal matters. He didn't know that a design could be protected for little money, and so, he couldn't do anything but watch Paul sell more instruments than himself, with the Wiesner pedal steel gaining quite some reputation among European players because Paul obviously was in the better position with his shop. Meanwhile, after building and selling about 10 guitars, Peter discontinued production, turning to and building frames for high-end race bicycles. After Paul Wiesner's untimely death, the blueprints ended up with a friend of his who wasn't in the position to continue production, while the steel guitar parts stock came into the possession of French steelers Lionel Wendling and Jean-Yves Lozac'h. The latter, who also was owner of an S12 universal Schild steel, assembled one last Wiesner from the parts, and later built a Wiesner copy from newly-made parts. But production of the Wiesner was never taken up again. 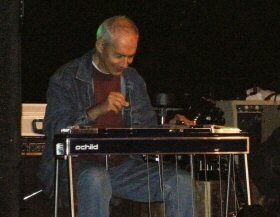 In 2003 Peter Schild decided he would pick up steel guitar design where he left off nearly a decade earlier, but with a thorough rethinking of nearly every part of the guitar, not only to improve serviceability and sound, but also in consideration of the fact that there were new manufacturing processes now that had not been available before. You are looking, then, at the result of a 30-year old love affair with the instrument called pedal steel guitar which will continue and ensure that more novelty features of the instrument will be forthcoming from this enterprise. For instance, Paul Wiesner's (or his mechanic's) legacy to the steel guitar world was not his copied guitar but the two-way halfstop, i.e. a halfstop whose half position can be distinctly felt not only while engaging but also while disengaging the knee lever. Peter's independent research lead to a halfstop device similar in feel but different in construction with the main aim to avoid an additional and increasing load on the lever on its way to the end stop. The new Schild guitar features this halfstop exclusively, as an option. The standard halfstop effect ('feelstop') achieved when the change on another string starts midway will be available, of course, but the "industry standard", the spring-type halfstop will not be available, as it is, from the perspective of Schild steel guitar.